If we evaluate both roads and consider what remains to be done for the exploiters to achieve their aim, we should say that it is precisely the western democracies that are the more advanced of the two along the road of total control, and not the totalitarian ‘communist’ regimes. In fact, in having chosen the quickest road to total control (that of ideology and complete control of the State apparatus) the latter have chosen the least stable and at the same time the most dangerous (for them) road. These regimes are sitting on a huge potential explosion of rebellion, not only of a specific marginalised minority (as is the case with the western democracies), but concerning the great mass of the exploited. On the other hand, the western democracies—not so much through their own merit but through the mechanism of capitalist competition—have found themselves faced with the need to have recourse to more subtle means of dominion and can therefore realise more carefully and intelligently the type of control that characterises real fascism today. No accident is involved here, nor a bad joke of history. Here the duplication of systems is not apparent but real. Everything points to the fact that we have to deal with expressions and consequences of identical principles applied to different levels of historical and political development. Whether party ‘communists’ like it or not, the fact remains that the State order and rule in Russia are indistinguishable from those in Italy and Germany. Essentially they are alike. One may speak of a red, black, or brown ‘soviet State’, as well as of red, black or brown fascism. Though certain ideological differences exist between these countries, ideology is never of primary importance. Ideologies, furthermore, are changeable and such changes do not necessarily reflect the character and the functions of the State apparatus. Furthermore, the fact that private property still exists in Germany and Italy is only a modification of secondary importance. The abolition of private property alone does not guarantee socialism. Private property can also be abolished within capitalism. What actually determines a socialist society is, besides the doing away with private property in the means of production, the control of the workers over the products of their labour and the end of the wage system. Both of these achievements are unfulfilled in Russia, as well as in Italy and Germany. Though some may assume that Russia is one step nearer to socialism than the other countries, it does not follow that its ‘soviet State’ has helped the international proletariat come in any way nearer to its class struggle goals. On the contrary, because Russia calls itself a socialist State, it misleads and deludes the workers of the world. The thinking worker knows what fascism is and fights it, but as regards Russia, he is only too often inclined to accept the myth of its socialistic nature. This delusion hinders a complete and determined break with fascism, because it hinders the principle struggle against the reasons, preconditions, and circumstances which in Russia, as in Germany and Italy, have led to an identical State and governmental system. Thus the Russian myth turns into an ideological weapon of counterrevolution. It is not possible for men to serve two masters. Neither can a totalitarian State do such a thing. If fascism serves capitalistic and imperialistic interests, it cannot serve the needs of the workers. If, in spite of this, two apparently opposing classes favour the same State system, it is obvious that something must be wrong. One or the other class must be in error. No one should say here that the problem is one merely of form and therefore of no real significance, that, though the political forms are identical, their content may vary widely. This would be self-delusion. For the Marxist such things do not occur; for him form and content fit to each other and they cannot be divorced. Now, if the Soviet State serves as a model for fascism, it must contain structural and functional elements which are also common to fascism. To determine what they are we must go back to the ‘soviet system’ as established by Leninism, which is the application of the principles of bolshevism to the Russian conditions. And if an identity between bolshevism and fascism can be established, then the proletariat cannot at the same time fight fascism and defend the Russian ‘soviet system’. Instead, the struggle against fascism must begin with the struggle against bolshevism. From the beginning, bolshevism was for Lenin a purely Russian phenomenon. During the many years of his political activity, he never attempted to elevate the Bolshevik system to forms of struggles in other countries. He was a social democrat who saw in Bebel and Kautsky the genial leaders of the working class, and he ignored the left-wing of the German socialist movement struggling against these heroes of Lenin and against all the other opportunists. Ignoring them, he remained in consistent isolation surrounded by a small group of Russian emigrants, and he continued to stand under Kautsky’s sway even when the German ‘left’, under the leadership of Rosa Luxemburg, was already engaged in open struggle against Kautskyism. Lenin was concerned only with Russia. His goal was the end of the Czarist feudal system and the conquest of the greatest amount of political influence for his social democratic party within the bourgeois society. However, it realized that it could stay in power and drive on the process of socialization only if it could unleash the world revolution of the workers. But its own activity in this respect was quite an unhappy one. By helping to drive the German workers back into the parties, trade unions, and parliament, and by the simultaneous destruction of the German council (soviet) movement, the Bolsheviks lent a hand to the defeat of the awakening European revolution. The Bolshevik Party, consisting of professional revolutionists on the one hand and large backward masses on the other, remained isolated. It could not develop a real soviet system within the years of civil war, intervention, economic decline, failing socialization experiments, and the improvised Red Army. Though the soviets, which were developed by the Mensheviks, did not fit into the Bolshevist scheme, it was with their help that the Bolsheviks came to power. With the stabilisation of power and the economic reconstruction process, the Bolshevik Party did not know how to coordinate the strange soviet system to their own decisions and activities. Nevertheless, socialism was also the desire of the Bolsheviks, and it needed the world proletariat for its realization. Lenin thought it essential to win the workers of the world over to the Bolshevik methods. It was disturbing that the workers of other countries, despite the great triumph of bolshevism, showed little inclination to accept for themselves the Bolshevik theory and practice, but tended rather in the direction of the council movement that arose in a number of countries, and especially in Germany. This council movement Lenin could use no longer in Russia. In other European countries it showed strong tendencies to oppose the Bolshevik type of uprisings. Despite Moscow’s tremendous propaganda in all countries, the so-called ‘ultra-lefts’, as Lenin himself pointed out, agitated more successfully for revolution on the basis of the council movement than did all the propagandists sent by the Bolshevik Party. The Communist Party, following bolshevism, remained a small, hysterical, and noisy group consisting largely of the proletarianized shreds of the bourgeoisie, whereas the council movement gained in real proletarian strength and attracted the best elements of the working class. To cope with this situation, Bolshevik propaganda had to be increased; the ‘ultra-left’ had to be attacked; its influence had to be destroyed in favour of bolshevism. Since the soviet system had failed in Russia, how could the radical ‘competition’ dare to attempt to prove to the world that what could not be accomplished by bolshevism in Russia might very well be realized independently of bolshevism in other places? Against this competition Lenin wrote his pamphlet ‘Radicalism, an Infantile Disease of Communism’, dictated by fear of losing power and by indignation over the success of the heretics. At first this pamphlet appeared with the subheading, ‘Attempt at a popular exposition of the Marxian strategy and tactic’, but later this too ambitious and silly declaration was removed. It was a little too much. This aggressive, crude, and hateful papal bull was real material for any counter revolutionary. Of all programmatic declarations of bolshevism it was the most revealing of its real character. It is bolshevism unmasked. When in 1933 Hitler suppressed all socialist and communist literature in Germany, Lenin’s pamphlet was allowed publication and distribution. As regards the content of the pamphlet, we are not concerned here with what it says in relation to the Russian Revolution, the history of bolshevism, the polemic between bolshevism and other streams of the labour movement, or the circumstances allowing for the Bolshevik victory, but solely with the main points by which at the time of the discussion between Lenin and ‘ultra-leftism’, the decisive differences between the two opponents were illustrated. The Bolshevik Party, originally the Russian social democratic section of the Second International, was built not in Russia but during the emigration. After the London split in 1903, the Bolshevik wing of the Russian social democracy was no more than a small sect. The ‘masses’ behind it existed only in the brain of its leader. However, this small advance guard was a strictly disciplined organization, always ready for militant struggles and continually purged to maintain its integrity. The party was considered the war academy of professional revolutionists. Its outstanding pedagogical requirements were unconditional leader authority, rigid centralism, iron discipline, conformity, militancy, and sacrifice of personality for party interests. What Lenin actually developed was an elite of intellectuals, a centre which, when thrown into the revolution would capture leadership and assume power. There is no use to try to determine logically and abstractly if this kind of preparation for revolution is right or wrong. The problem has to be solved dialectically. Other questions also must be raised: What kind of a revolution was in preparation? What was the goal of the revolution? Lenin’s party worked within the belated bourgeois revolution in Russia to overthrow the feudal regime of Czarism. The more centralized the will of the leading party in such a revolution and the more single-minded, the more success would accompany the process of the formation of the bourgeois State and the more promising would be the position of the proletarian class within the framework of the new State. What, however, may be regarded as a happy solution of revolutionary problems in a bourgeois revolution cannot at the same time be pronounced as a solution for the proletarian revolution. The decisive structural difference between the bourgeois and the new socialist society excludes such an attitude. According to Lenin’s revolutionary method, the leaders appear as the head of the masses. Possessing the proper revolutionary schooling, they are able to understand situations and direct and command the fighting forces. They are professional revolutionists, the generals of the great civilian army. This distinction between head and body, intellectuals and masses, officers, and privates corresponds to the duality of class society, to the bourgeois social order. One class is educated to rule; the other to be ruled. It is from this old class formula that Lenin’s party concept emerged. His organisation is only a replica of bourgeois reality. His revolution is objectively determined by the forces that create a social order incorporating these class relations, regardless of the subjective goals accompanying this process. Whoever wants to have a bourgeois order will find in the divorce of leader and masses, the advance guard and working class, the right strategic preparation for revolution. The more intelligent, schooled, and superior is the leadership and the more disciplined and obedient are the masses, the more chances such a revolution will have to succeed. In aspiring to the bourgeois revolution in Russia, Lenin’s party was most appropriate to his goal. When, however, the Russian revolution changed its character, when its proletarian features came more to the fore, Lenin’s tactical and strategic methods ceased to be of value. If he succeeded anyway it was not because of his advance guard, but because of the soviet movement which had not at all been incorporated in his revolutionary plans. And when Lenin, after the successful revolution which was made by the soviets, dispensed again with this movement, all that had been proletarian in the Russian Revolution was also dispensed with. The bourgeois character of the Revolution came to the fore again, finding its natural completion in Stalinism. Despite his great concern with Marxian dialectics, Lenin was not able to see the social historical processes in a dialectical manner. His thinking remained mechanistic, following rigid rules. For him there was only one revolutionary party—his own; only one revolution—the Russian; only one method—the Bolshevik. And what had worked in Russia would work also in Germany, France, America, China and Australia. What was correct for the bourgeois revolution in Russia would be correct also for the proletarian world revolution. The monotonous application of a once discovered formula moved in an egocentric circle undisturbed by time and circumstances, developmental degrees, cultural standards, ideas and men. In Lenin came to light with great clarity the rule of the machine age in politics; he was the ‘technician’, the ‘inventor’, of the revolution, the representative of the all-powerful will of the leader. All fundamental characteristics of fascism were in his doctrine, his strategy, his social ‘planning’, and his art with dealing with men. He could not see the deep revolutionary meaning of the rejection of traditional party policies by the left. He could not understand the real importance of the soviet movement for the socialist orientation of society. He never learned to know the prerequisites for the freeing of the workers. Authority, leadership, force, exerted on one side, and organization, cadres, subordination on the other—such was his line of reasoning. Discipline and dictatorship are the words that are most frequent in his writings. It is understandable, then, why he could not comprehend nor appreciate the ideas and actions of the ‘ultra-left’, which would not accept his strategy and which demanded what was most obvious and most necessary for the revolutionary struggle for socialism, namely that the workers take their fate into their own hands once and for all. To take their destiny into their own hands—this keyword to all questions of socialism—was the real issue in all the polemics between the ultra-lefts and the Bolsheviks. The disagreement on the party question was paralleled by the disagreement on trade unionism. The ultra-left was of the opinion that there was no longer a place for revolutionists in trade unions; that it was rather necessary for them to develop their own organizational forms within the factories, the common working places. However, thanks to their unearned authority, the Bolsheviks had been able even in the first weeks of the German revolution to drive the workers back into the capitalistic reactionary trade unions. To fight the ultra-lefts, to denounce them as stupid and as counterrevolutionary, Lenin in his pamphlet once more makes use of his mechanistic formulas. In his arguments against the position of the left he does not refer to German trade unions but to the trade union experiences of the Bolsheviks in Russia. It is a generally accepted fact that in their early beginnings trade unions were of great importance for the proletarian class struggle. The trade unions in Russia were young and they justified Lenin’s enthusiasm. However, the situation was different in other parts of the world. Useful and progressive in their beginnings, the trade unions in the older capitalistic countries had turned into obstacles in the way of the liberation of the workers. They had turned into instruments of counter revolution, and the German left drew its conclusions from this changed situation. Lenin himself could not help declaring that in the course of time there had developed a layer of a ‘strictly trade-unionist, imperialistic orientated, arrogant, vain, sterile, egotistical, petty-bourgeois, bribed, and demoralised aristocracy of labour’. This guild of corruption, this gangster leadership, today rules the world trade union movement and lives on the back of the workers. It was of this trade union movement that the ultra-left was speaking when it demanded that the workers should desert it. Lenin, however, demagogically answered by pointing to the young trade union movement in Russia which did not as yet share the character of the long established unions in other countries. Employing a specific experience at a given period and under particular circumstance, he thought it possible to draw from it conclusions of worldwide application. The revolutionist, he argued, must always be where the masses are. But in reality where are the masses? In trade union offices? At membership meetings? At the secret meetings of the leadership with the capitalistic representatives? No, the masses are in the factories, in their working places; and there it is necessary to affect their cooperation and strengthen their solidarity. The factory organization, the council system, is the real organisation of the revolution, which must replace all parties and trade unions. In factory organizations there is no room for professional leadership, no divorce of leaders from followers, no caste distinction between intellectuals and the rank and file, no ground for egotism, competition, demoralization, corruption, sterility and philistinism. Here the workers must take their lot in their own hands. But Lenin thought otherwise. He wanted to preserve the unions; to change them from within; to remove the social democratic officials and replace them with Bolshevik officials; to replace a bad with a good bureaucracy. The bad one grows in a social democracy; the good one in bolshevism. Twenty years of experience meanwhile have demonstrated the idiocy of such a concept. Following Lenin’s advice, the Communists have tried all and sundry methods to reform trade unions. The result was nil. The attempt to form their own trade unions was likewise nil. The competition between social democratic and Bolshevik trade union work was a competition in corruption. The revolutionary energies of the workers were exhausted in this very process. Instead of concentrating upon the struggle against fascism, the workers were engaged in a senseless and result-less experimentation in the interest of diverse bureaucracies. The masses lost confidence in themselves and in ‘their’ organizations. They felt themselves cheated and betrayed. The methods of fascism, to dictate each step of the workers, to hinder the awakening of self-initiative, to sabotage all beginnings of class-consciousness, to demoralise the masses through innumerable defeats and to make them impotent—all these methods had already been developed in the twenty years of work in the trade unions in accordance with Bolshevik principles. The victory of fascism was such an easy one because the labour leaders in trade unions and parties had prepared for them the human material capable of being fitted into the fascistic scheme of things. On the question of parliamentarianism, too, Lenin appears in the role of the defender of a decayed political institution which had become a hindrance for further political development and a danger to proletarian emancipation. The ultra-lefts fought parliamentarianism in all its forms. They refused to participate in elections and did not respect parliamentary decisions. Lenin, however, put much effort into parliamentary activities and attached much importance to them. The ultra-left declared parliamentarianism historically passé even as a tribune for agitation, and saw in it no more than a continuous source of political corruption for both parliamentarian and workers. It dulled the revolutionary awareness and consistency of the masses by creating illusions of legalistic reforms, and on critical occasions the parliament turned into a weapon of counter revolution. It had to be destroyed, or, where nothing else was possible, sabotaged. The parliamentary tradition, still playing a part in proletarian consciousness, was to be fought. To achieve the opposite effect, Lenin operated with the trick of making a distinction between the historically and politically passé institutions. Certainly, he argued, parliamentarianism was historically obsolete, but this was not the case politically, and one would have to reckon with it. One would have to participate because it still played a part politically. What an argument! Capitalism, too, is only historically and not politically obsolete. According to Lenin’s logic, it is then not possible to fight capitalism in a revolutionary manner. Rather a compromise would have to be found. Opportunism, bargaining, political horse-trading,—that would be the consequence of Lenin’s tactic. The monarchy, too, is only historically but not politically surpassed. According to Lenin, the workers would have no right to do away with it but would be obliged to find a compromise solution. The same story would be true as regards the church, also only historically but not politically antedated. Furthermore, the people belong in great masses to the church. As a revolutionist Lenin pointed out that one had to be where the masses are. Consistency would force him to say ‘Enter the Church; it is your revolutionary duty!’ Finally, there is fascism. One day, too, fascism will be historically antedated but politically still in existence. What is then to be done? To accept the fact and to make a compromise with fascism. According to Lenin’s reasoning, a pact between Stalin and Hitler would only illustrate that Stalin actually is the best disciple of Lenin. And it will not at all be surprising if in the near future the Bolshevist agents will hail the pact between Moscow and Berlin as the only real revolutionary tactic. Lenin’s position on the question of parliamentarianism is only an additional illustration of his incapacity to understand the essential needs and characteristics of the proletarian revolution. His revolution is entirely bourgeois; it is a struggle for the majority, for governmental positions, for a hold upon the law machine. He actually thought it of importance to gain as many votes as possible at election campaigns, to have a strong Bolshevik fraction in the parliaments, to help determine the form and content of legislation, to take part in political rule. He did not notice at all that today parliamentarianism is a mere bluff, an empty make-believe, and that the real power of bourgeois society rests in entirely different places; that despite all possible parliamentary defeats the bourgeoisie would still have at hand sufficient means to assert its will and interest in non-parliamentary fields. Lenin did not see the demoralising effects parliamentarianism had upon the masses, he did not notice the poisoning of public morals through parliamentary corruption. Bribed, bought, and cowed, parliamentary politicians were fearful for their income. There was a time in pre-fascist Germany when the reactionaries in parliament were able to pass any desired law merely by threatening to bring about the dissolution of parliament. There was nothing more terrible to the parliamentary politicians than such a threat which implied the end of their easy incomes. To avoid such an end, they would say yes to anything. And how is it today in Germany, in Russia, in Italy? The parliamentary helots are without opinions, without will, and are nothing more than willing servants of their fascist masters. There can be no question that parliamentarianism is entirely degenerated and corrupt. But, why didn’t the proletariat stop this deterioration of a political instrument which had once been used for their purposes? To end parliamentarianism by one heroic revolutionary act would have been far more useful and educational for the proletarian consciousness than the miserable theatre in which parliamentarianism has ended in the fascistic society. But such an attitude was entirely foreign to Lenin as it is foreign to Stalin today. Lenin was not concerned with the freedom of the workers from their mental and physical slavery; he was not bothered by the false consciousness of the masses and their human self-alienation. The whole problem to him was nothing more nor less than a problem of power. Like a bourgeois, he thought in terms of gains and losses, more or less, credit and debit; and all his business-like computations deal only with external things: membership figures, number of votes, seats in parliaments, control positions. His materialism is a bourgeois materialism, dealing with mechanisms, not with human beings. He is not really able to think in socio-historical terms. Parliament to him is parliament; an abstract concept in a vacuum, holding equal meaning in all nations, at all times. Certainly he acknowledges that parliament passes through different stages, and he points this out in his discussions, but he does not use his own knowledge in his theory and practice. In his pro-parliamentarian polemics he hides behind the early capitalist parliaments in the ascending stage of capitalism, in order not to run out of arguments. And if he attacks the old parliaments, it is from the vantage point of the young and long outmoded. In short, he decides that politics is the art of the possible. However, politics for the workers is the art of revolution. It remains to deal with Lenin’s position on the question of compromises. During the World War the German Social Democracy sold out to the bourgeoisie. Nevertheless, much against its will, it inherited the German revolution. This was made possible to a large extent by the help of Russia, which did its share in killing off the German council movement. The power which had fallen into the lap of Social Democracy was used for nothing. The Social Democracy simply renewed its old class collaboration policy, satisfied with sharing power over the workers with the bourgeoisie in the reconstruction period of capitalism. The German radical workers countered this betrayal with the slogan, ‘No compromise with the counter revolution’. Here was a concrete case, a specific situation, demanding a clear decision. Lenin, unable to recognize the real issues at stake, made from this concrete specific question a general problem. With the air of a general and the infallibility of a cardinal, he tried to persuade the ultra-lefts that compromises with political opponents under all conditions are a revolutionary duty. If today one reads those passages in Lenin’s pamphlet dealing with compromises, one is inclined to compare Lenin’s remarks in 1920 with Stalin’s present policy of compromises. There is not one deadly sin of Bolshevik theory which did not become Bolshevistic reality under Lenin. According to Lenin, the ultra-lefts should have been willing to sign the Treaty of Versailles. However, the Communist Party, still in accordance with Lenin, made a compromise and protested against the Versailles Treaty in collaboration with the Hitlerites. The ‘National bolshevism’ propagandized in 1919 in Germany by the left-winger Lauffenberg was in Lenin’s opinion ‘an absurdity crying to heaven’. But Radek and the Communist Party-—again in accordance with Lenin’s principle—concluded a compromise with German Nationalism, and protested against the occupation of the Ruhr basin and celebrated the national hero Schlageter. The League of Nations was, in Lenin’s own words, ‘a band of capitalist robbers and bandits’, whom the workers could only fight to the bitter end. However, Stalin—in accordance with Lenin’s tactics—made a compromise with these very same bandits, and the USSR entered the League. The concept ‘folk’ or ‘People’ is in Lenin’s opinion a criminal concession to the counterrevolutionary ideology of the petty bourgeoisie. This did not hinder the Leninists, Stalin and Dimitrov, from making a compromise with the petty bourgeoisie in order to launch the freakish ‘Peoples Front’ movement. For Lenin, imperialism was the greatest enemy of the world proletariat, and against it all forces had to be mobilized. But Stalin, again in true Leninist fashion, is quite busy with cooking up an alliance with Hitler’s imperialism. Is it necessary to offer more examples? Historical experience teaches that all compromises between revolution and counterrevolution can serve only the latter. They lead only to the bankruptcy of the revolutionary movement. All policy of compromise is a policy of bankruptcy. What began as a mere compromise with the German Social Democracy found its end in Hitler. What Lenin justified as a necessary compromise found its end in Stalin. In diagnosing revolutionary non-compromise as ‘An Infantile Disease of Communism’, Lenin was suffering from the old age disease of opportunism, of pseudo communism. Bolshevism is a nationalistic doctrine. Originally and essentially conceived to solve a national problem, it was later elevated to a theory and practice of international scope and to a general doctrine. Its nationalistic character comes to light also in its position on the struggle for national independence of suppressed nations. Bolshevism is an authoritarian system. The peak of the social pyramid is the most important and determining point. Authority is realized in the all-powerful person. In the leader myth the bourgeois personality ideal celebrates its highest triumphs. Organizationally, bolshevism is highly centralistic. The central committee has responsibility for all initiative, leadership, instruction, commands. As in the bourgeois State, the leading members of the organization play the role of the bourgeoisie; the sole role of the workers is to obey orders. 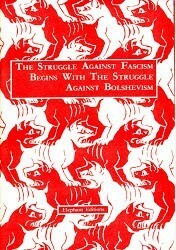 Bolshevism represents a militant power policy. Exclusively interested in political power, it is no different from the forms of rule in the traditional bourgeois sense. Even in the organization proper there is no self-determination by the members. The army serves the party as the great example of organization. Bolshevism is dictatorship. Working with brute force and terroristic measures, it directs all its functions toward the suppression of all non-Bolshevik institutions and opinions. Its ‘dictatorship of the proletariat’ is the dictatorship of a bureaucracy or a single person. Bolshevism is a mechanistic method. It aspires to automatic coordination, technically secured conformity and the most efficient totalitarianism as a goal of social order. The centralistically ‘planned’ economy consciously confuses technical-organizational problems with socioeconomic questions. The social structure of bolshevism is of a bourgeois nature. It does not abolish the wage system and refuses proletarian self-determination over the products of labour. It remains therewith fundamentally within the class frame of the bourgeois social order. Capitalism is perpetuated. Bolshevism is a revolutionary element only in the frame of the bourgeois revolution. Unable to realize the soviet system, it is thereby unable to transform essentially the structure of bourgeois society and its economy. It establishes not socialism but State capitalism. Bolshevism is not a bridge leading eventually into the socialist society. Without the soviet system, without the total radical revolution of men and things, it cannot fulfil the most essential of all socialistic demands, which is to end the capitalist human-self alienation. It represents the last stage of bourgeois society and not the first step towards a new society.